Hope that all of you are enjoying sunny beach walks this month! It’s an exciting time at COASST. 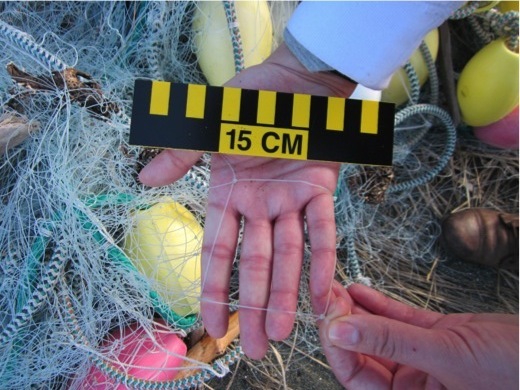 Tomorrow, we are holding our first marine debris pilot training session in Ocean Shores, Washington, and last week we met up with COASSTers in Neah Bay, Washington for a refresher training on the beach. We’re also getting ready for upcoming trainings in California and Oregon next month. A big thank you to all of you for your hard work. If you have any datasheets or photos lying around, please send them our way! We can’t wait to see them. Can we get to the species with just two wings? Sure! Alaska wing key (page 44): A smidgeon of the upperwing is visible in the top photo– select “dark, some species w/ white spots or edging.” Upperwing dark (go to Q5). Underwing linings not white (go to Q9). Wing chord more than 35cm (go to Q14). Q14 asks us to check individual primaries: look at the bottom photo – the last primary is super short – must be a Bald Eagle. West Coast wing key (page 33): A smidgeon of the upperwing is visible in the top photo– select “primarily dark, some species w/ pale spots of thing stripes (go to Q2).” Upperwing simple dark (go to Q3). Underwing is dark (go to Q6). Check the wing for smudges – nope. But the “outermost primary IS more than a feather width shorter than the next – a Bald Eagle. West Coast wing table (page 32): Too rare! This species, if included would fall into dark upperwimg, HUGE (wing chord >43cm). 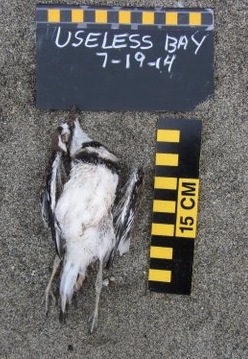 Lani and Betty found this bird on August 4th at Harbor Mouth in Alaska. Since the foot is hidden, let’s use the wing – it’s unique! 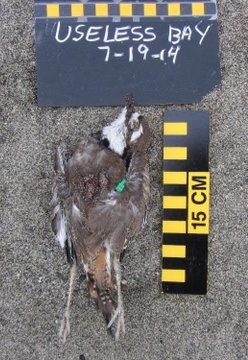 Alaska wing key (page 44): On Q1, select “gray, some species w/ dark tips and/or dark stripe(s) on mantle (go to Q25). Aha! “Broken dark diagonal stripe from wrist to elbow (go to Q26). No idea about the underwing, so we’re left with BLKI-i (LA14) and BOGU-I (LA18). Note the immature Black-legged Kittiwake has white secondaries and the immatyue Bonaparte’s Gull has dark secondaries – this must be an immature BLKI – a young chick, not yet fully grown. West Coast wing key (page 33): Select “gray, some species w/ dark tips and/or dark stripe(s) on mantle, go to Q10.” Wing tips DO contrast (go to Q12). Aha! “mottled ‘stripe’ from elbow to wrist” – two species: BLKI-j (LA13) and CATE-j (LA19). 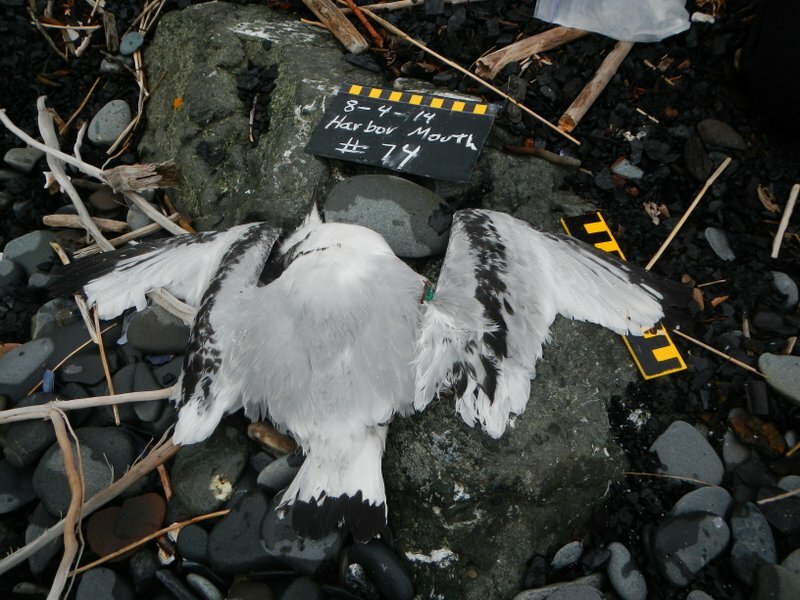 The mottled “stripe” is definitely black, not brown – Black-legged Kittiwake! West Coast wing table (page 32): Wing is 21cm, so we should consider Med (21-24cm), one row up Small (18-20cm) and one row down, Med-Lg (25-28cm). Upperwing is mostly gray, so scan across to the next page where “Gray Mantle” appears as a column header. Yikes! Nothing in any of these size classes. Let’s take it down one more row, where we find BLKI (LA13) and RLKI (LA23). Between the two, the Black-legged kittiwake is the one with the paler mantle, black wing tips and black diagonal wing stripe. Is a bottle just a bottle and a cap just a cap? 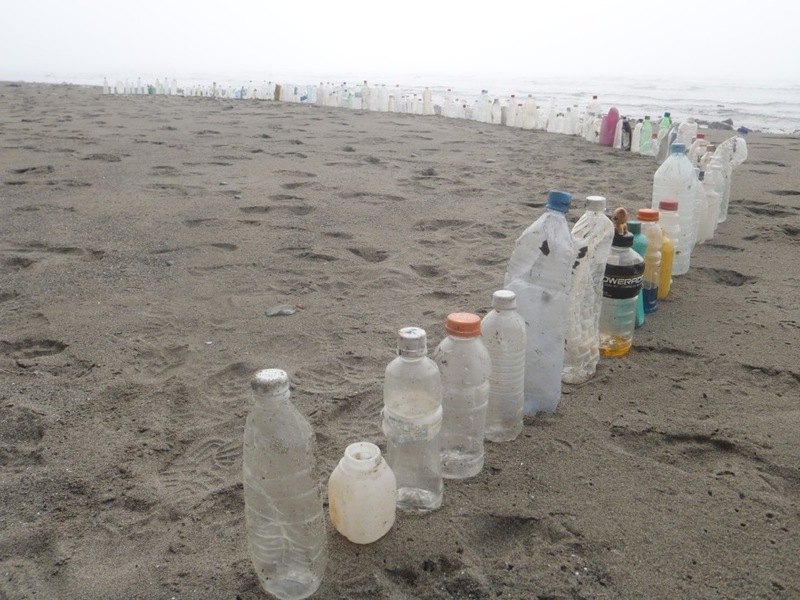 This photo taken by Kari on her August survey at Duk Point (WA) demonstrates the variety of shape, color, size, material and condition of what we might think of as “beverage bottles”. The variety matters: shapes are sometimes particular to country of origin and tell us how far and where a bottle may have come from. 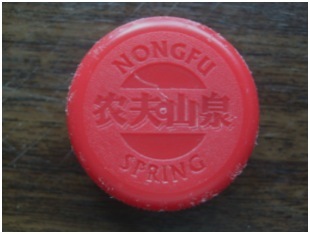 Bottle caps that are in the red end of the color spectrum like this one, found by Janis and Judy on Ruby South Beach (WA) in April, are often confused for food by many seabird species. 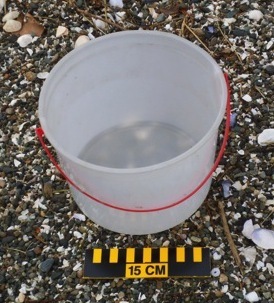 Speaking of marine debris, thanks to Paul at Ocean Park South in Washington for helping us to identify the black piping featured in What’s Washed In on August 8. 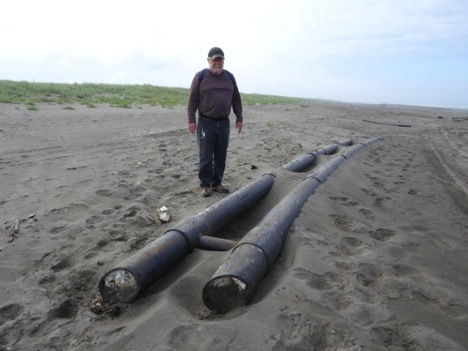 These black tubes appear to be the remains of a net pen called a polar circle, which is used in salmon farming. Not a bird, but quite an interesting carcass! Candace found this sturgeon at Otter Point on May 28. 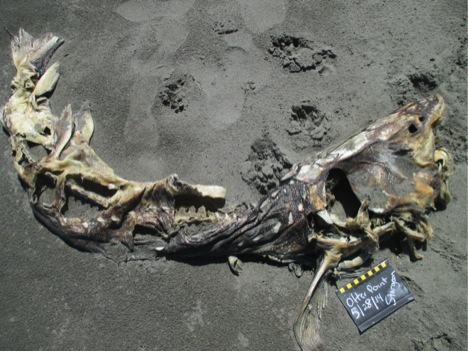 White sturgeons, also known as Pacific sturgeons, are found along the West Coast. Sturgeon are anadromous fish, meaning they start their lives in freshwater and then migrate to saltwater. Sturgeon may return to freshwater to spawn multiple times over their life. They can live up to 100 years, and they are also the largest freshwater species in North America, growing up to 20 feet in length! 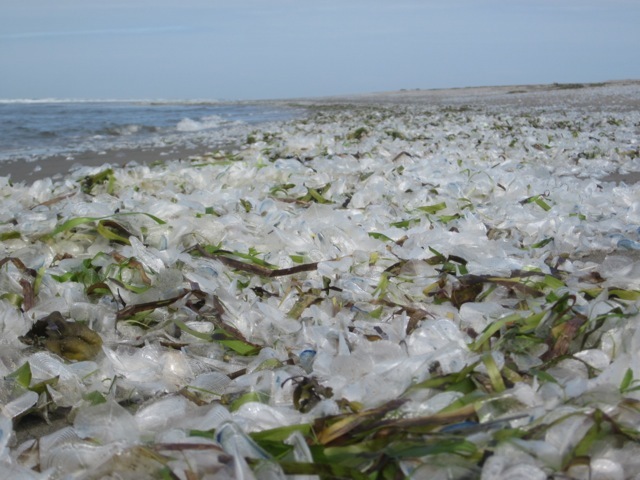 This entry was posted in Uncategorized and tagged bottle caps, refresher training, sturgeon, Washington on August 22, 2014 by coasst. 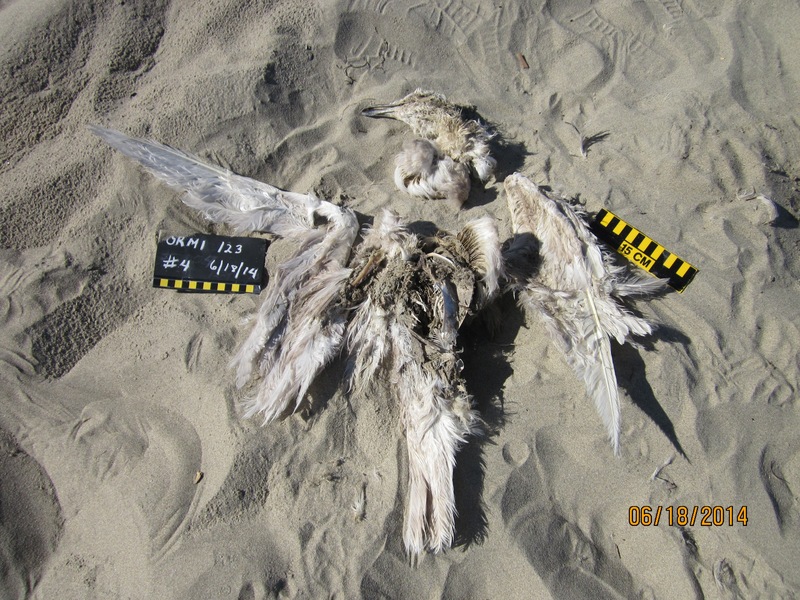 This entry was posted in Uncategorized and tagged Beached Bird's Refresher, Marine Debris, Marine Debris Pilot Training, sea star survey, Valella valella on August 8, 2014 by coasst.